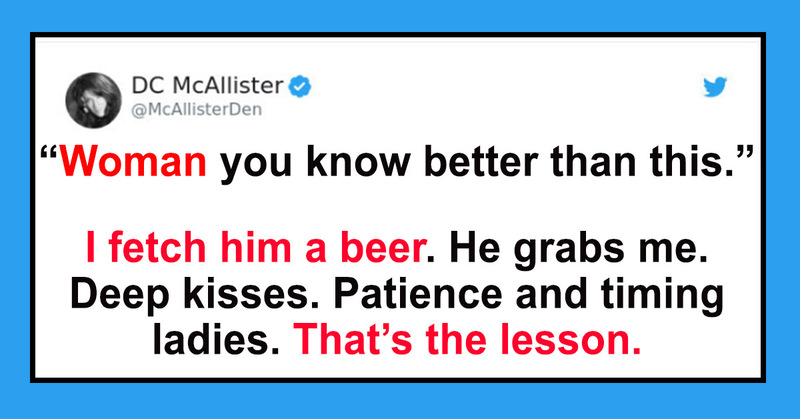 SO, Denise McAllister did us all a massive favor on Twitter the other day and instructed women how to behave during the game. Maybe you missed it? 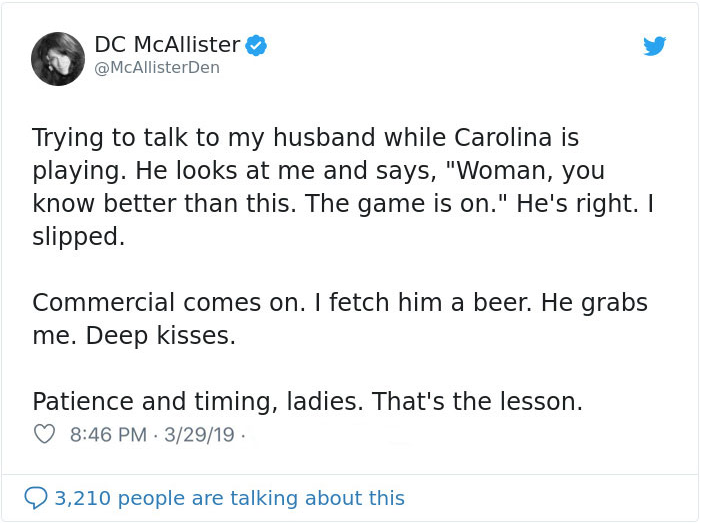 Though I can’t imagine how… all women are scrambling over one other to figure out just what we’re supposed to do during the game?! We couldn’t possibly be watching it?! We couldn’t possibly communicate with those who are watching it, especially if they happen to be menfolk! We’ve been trying to ask our partners important questions when the game is on, like idiots. At least good old Denise is here to sort us out and tell us how it should be done! Okay… Okay, deep breaths everyone… let’s just walk each other through this. DENISE. YOU SPOKE?!? DURING THE GAME?! DENISE, WOMAN, YOU KNOW BETTER THAN THIS. Okay, let’s get one thing straight. Your significant other should call you by that thing all other humans are capable of calling you by, your name. Randomly yelling somebodies gender is not how civilized, educated individuals refer to one another. NEXT. Then we come to the real cherry on top of this disastrously sad excuse of a Sundae. To reward her husband for behaving like a complete thug, Denise merrily skips to the kitchen (you know, that place where women are born!) and “fetches” him a beer. Tra-la-la, the life of a domestic goddess, eh girls? It’s a fine time. Then he kisses her?! DEEPLY no less? Oh, honey! Lucky you, getting snogged by a brute without the brain capacity to remember your actual name. Wow. Tell us more. You absolute love guru.